Identify developments in global aquatic animal disease issues and standards of importance to the region. Review and evaluate the Quarterly Aquatic Animal Disease reporting programme and assess the list of diseases of regional concern. 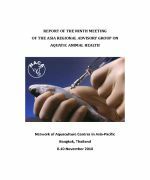 Provide guidance and leadership on regional strategies for improving management of aquatic animal health, including those under the framework of the Asia Regional Technical Guidelines on Health Management for the Responsible Movement of Live Aquatic Animals. Monitor and evaluate progress on Technical Guidelines implementation. Facilitate coordination and communication of progress on regional aquatic animal health programmes. Advise in identification and designation of regional aquatic animal health resources, as Regional Resource Experts, Regional Resource Centres and Regional Reference Laboratories. Identify issues of relevance to the region that require depth review and propose appropriate actions needed. 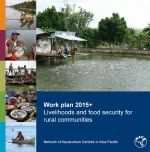 This collection comprises the reports of the annual meetings of the group. The reports are a rich source of information concerning the current disease status of the region and new or emerging diseases of aquatic animals. The Asia Regional Advisory Group on Aquatic Animal Health meets annually to discuss regional health issues including emerging disease threats. This report includes a review of regional disease status circa 2016, global and regional disease reporting arrangements, global issues and standards, progress in implementation of the the Regional Technical Guidelines on Health management for the Responsible Movement of Live Aquatic Animals, identification and designation of regional aquatic animal health resources and regional and international cooperation. The Asia Regional Advisory Group on Aquatic Animal Health meets annually to discuss regional health issues including emerging disease threats. This report includes a review of regional disease status circa 2015, global and regional disease reporting arrangements, global issues and standards, progress in implementation of the the Regional Technical Guidelines on Health management for the Responsible Movement of Live Aquatic Animals, identification and designation of regional aquatic animal health resources and regional and international cooperation. The Asia Regional Advisory Group on Aquatic Animal Health meets annually to discuss regional health issues including emerging disease threats. This report includes a review of regional disease status circa 2014, global and regional disease reporting arrangements, global issues and standards, progress in implementation of the the Regional Technical Guidelines on Health management for the Responsible Movement of Live Aquatic Animals, identification and designation of regional aquatic animal health resources and regional and international cooperation. The Asia Regional Advisory Group on Aquatic Animal Health meets annually to discuss regional health issues including emerging disease threats. 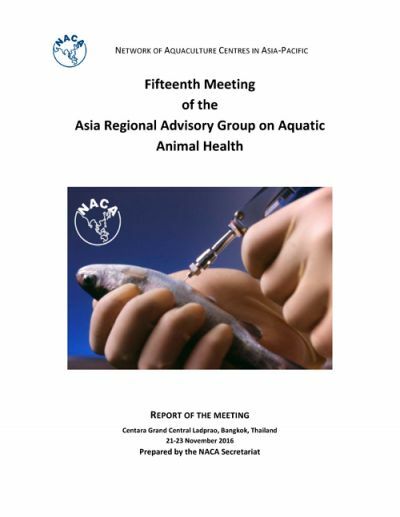 This report includes a review of regional disease status circa 2013, global and regional disease reporting arrangements, global issues and standards, progress in implementation of the the Regional Technical Guidelines on Health management for the Responsible Movement of Live Aquatic Animals, identification and designation of regional aquatic animal health resources and regional and international cooperation. The Asia Regional Advisory Group on Aquatic Animal Health meets annually to discuss regional health issues including emerging disease threats. This report includes a review of regional disease status circa 2012, global and regional disease reporting arrangements, global issues and standards, progress in implementation of the the Regional Technical Guidelines on Health management for the Responsible Movement of Live Aquatic Animals, identification and designation of regional aquatic animal health resources and regional and international cooperation. 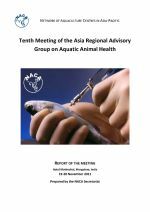 The Asia Regional Advisory Group on Aquatic Animal Health meets annually to discuss regional health issues including emerging disease threats. This report includes a review of regional disease status circa 2011, global and regional disease reporting arrangements, global issues and standards, progress in implementation of the the Regional Technical Guidelines on Health management for the Responsible Movement of Live Aquatic Animals, identification and designation of regional aquatic animal health resources and regional and international cooperation. The Asia Regional Advisory Group on Aquatic Animal Health meets annually to discuss regional health issues including emerging disease threats. This report includes a review of regional disease status circa 2010, global and regional disease reporting arrangements, global issues and standards, progress in implementation of the the Regional Technical Guidelines on Health management for the Responsible Movement of Live Aquatic Animals, identification and designation of regional aquatic animal health resources and regional and international cooperation. The Asia Regional Advisory Group on Aquatic Animal Health meets annually to discuss regional health issues including emerging disease threats. 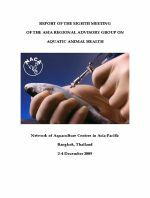 This report includes a review of regional disease status circa 2009, global and regional disease reporting arrangements, global issues and standards, progress in implementation of the the Regional Technical Guidelines on Health management for the Responsible Movement of Live Aquatic Animals, identification and designation of regional aquatic animal health resources and regional and international cooperation. The Asia Regional Advisory Group on Aquatic Animal Health meets annually to discuss regional health issues including emerging disease threats. This report includes a review of regional disease status circa 2008, global and regional disease reporting arrangements, global issues and standards, progress in implementation of the the Regional Technical Guidelines on Health management for the Responsible Movement of Live Aquatic Animals, identification and designation of regional aquatic animal health resources and regional and international cooperation.